What Happens in 7 Card Stud if the Dealer Runs out of Cards? - Casino Answers! Casino Answers » Poker » 7 Card Stud » What Happens in 7 Card Stud if the Dealer Runs out of Cards? This is a common question, and one that players aren’t sure the answer to. It’s possible for the dealer to run out of cards while playing 7 Card Stud. If all 8 players stay in the hand until the very end, then they all will be dealt seven cards. Except eight times seven is fifty six, and even if we discount burn cards, there’s still only fifty two cards in a deck of poker. There are simply not enough cards for eight players to play seven card stud until every single player has seven cards. This is quite the conundrum. So what happens if the dealer runs out of cards? The dealer quits his job, the casino gives free drinks to all the players and everyone gets a hundred dollars! When this happens, on the very rare occasion that it does, this card works like a river card in Texas Hold’Em so anyone can use it to make their hand. The betting can get pretty wild if this happens, at least it should with eight players in the hand, and you better hope it’s a good one. Everything else goes on the same way as if you were each dealt a card on seventh street, but in this case it is just in the middle of the table instead of in your hand. While this type of thing happens far more often in home games where there are wild cards and things of that nature used, but it also happens quite a bit online as well. Now you may be thinking – there’s no way that could possible happen. What are the odds that all players would go to the river? Well my friend, you aren’t playing poker at the right online poker rooms. 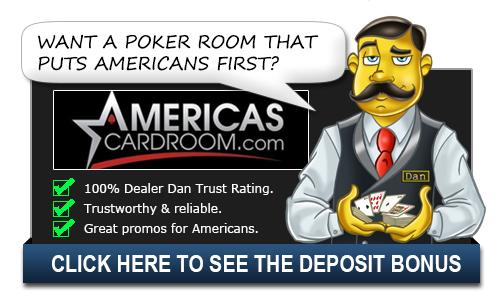 If you’re non-US, then be sure to head on over to Fortune Poker, because the players here are horrible, and the whole community card thing can actually be a regular occurrence at the 7 Card Stud tables. This can also be common in games of seven card stud hi/lo. That’s a game in which there are two pots: a high pot and a low pot. The high pot wins the same way you win a pot in almost any other poker game: by having the best hand. The low hand can then split the pot as long as someone has a hand with no cards higher than 8 with no pairs. Straights and Flushes don’t matter so the best hand for both pots could be something like A-2-3-4-5. Hi/Lo is more popular for Omaha players, but it is really fun in Seven Card Stud as well. It is offered at many online poker rooms like Full Tilt Poker.